The following article is a recap of the 2014 Pageland Christmas Parade by Autostar Pageland. If you arrived here in error you can click here to view our massive inventory or give us a call at (800) 680-0835. If you prefer email or text you can reach out to our World Class Internet Department with this form. Autostar Pageland, also known as “Autostar of Pageland” was very honored to be a part of the 2014 Pageland Christmas Parade! Our very own Shonte Joyner was on the scene. She drove our Autostar Certified Preowned 2013 Mustang Convertible (which is currently selling for $20,447 and only has 10,226 miles on it). 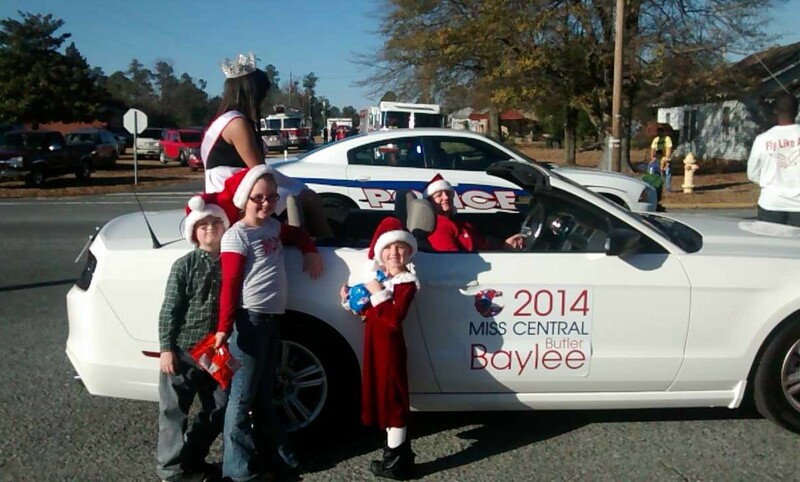 Heather drove the 2014 Miss Central, Baylee Butler in the convertible (pictures below). A member of our sales team, Elizabeth Mills, brought her children Kailyn, Emmie and Mikey who threw out candy and handed out our business cards (which have our $100 referral on the back which is a great way to pick up some extra money for the holidays) while they walked on both sides of the car as they went through town. Autostar of Pageland also sponsored the Grand Marshall float featuring the 2014 Central Track Team. The 2014 Central Track Team is coached by Shonte Joyner’s own pastor, Joel Dale of First Baptist Church in Pageland, SC.